David, I have my own Announcement to make … since you are persona non available-a right now, I am hereby devoting this fan space to someone else… keeping it warm for you, as it were. And I think you would approve of my choice… someone who is almost as much of a snappy dresser and dancer as you are… that’s right… I’ll be supporting Mr. Bill Nye the Science Guy in his bid to win the Dancing With the Stars crown this season. What can I say? He may not glow… or sing… but he’s where it’s at right now. So cats and kittens, fasten your seatbelts and prepare yourself for unabashed Science Guy fangirling. Are you guys with me??? 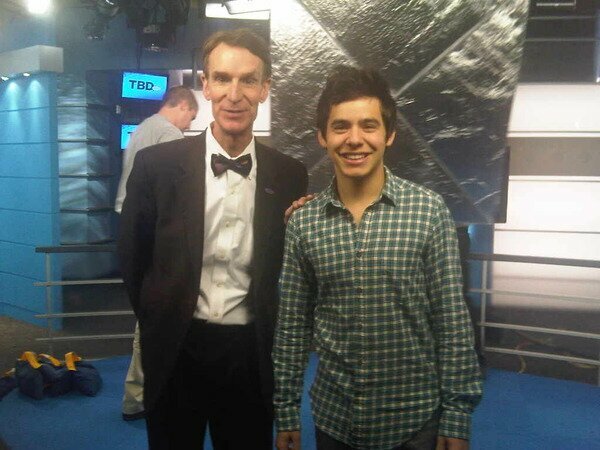 “That’s my name… not The Science Guy, but Bill Nye” … OMJ HE IS DAVID!!!!! 8 Responses to BILL! BILL! BILL! BILL! I’m with You!! Thought Len and Bruno were way too critical for the first night!! Like Carrie said he is what the show is about!! I’m sure David would be rooting for him too!! This might be my favourite post on here in the last 2 years!!! And that pic of David & Bill I think actually IS my favourite pic of all time. Like I love it so much it’s ridiculous. Poor Bill can’t dance though, lol. “The flaskkk has a neckkk.” Scientific dancing gets my vote. I will be counting on you TOfan to keep me updated!! !